Smart Transportation Market size is set to exceed USD 130 billion by 2024; according to a new research report by Global Market Insights, Inc. The smart transportation market growth is attributed to the worldwide government initiatives for the smart city development. Around USD 1 billion of connected things are mounted across the globe under the smart cities projects. Smart transportation being an integral part of smart cities project provides a platform for connected vehicles. The mandates set by the government, such as Directive on Intelligent Transport Systems and Bharat Stage standards, to reduce the CO2 emissions and to protect the environment also provide an impetus to the growth of the smart transportation market. Rapid urbanization and improved lifestyle have transformed the transportation infrastructure thereby driving the smart transportation market demand. The smart systems help the users in dealing with over speeding, bad weather conditions, and heavy traffic thus avoiding collisions and enhancing the user experience. Various connected technologies, such as IoT, smart sensors, and GPS, provide real-time information about traffic congestion in different areas, assisting the drivers in taking alternative routes. These systems reduce the passengers traveling time, improving the productivity and leading to the overall economic development of the country. However, the huge capital investment and time required to complete the transformation process of the existing infrastructure and transportation systems may hinder the smart transportation market growth. Roadways account for the largest industry share in the smart transportation market followed by railways and airways. Railways are anticipated to grow at a fast pace over the forecast period due to factors, such as cheaper transport fare and government investments, in developing smart railway systems. Airways are the preferred mode for freight transportation and airports worldwide have been investing in various smart technology solutions to reduce air traffic congestion and delays. For instance, in 2017, airlines and airports invested around USD 33 billion to improve the airport infrastructure by going through a digital transformation mainly focused on providing self-service processes at bag-drop, check-ins, and boarding using new technologies such as IoT, sensors, and beacons. The penetration of integration services is the highest in the smart transportation market as they deliver a high level of performance and intelligence. Advanced technologies, such as computers, electronics, smart sensors, and information & communication, need to be integrated with transport infrastructure and vehicles to reduce traffic congestion and environmental impact of greenhouse gases and to improve the transport efficiency. The cloud deployment model in smart transportation market is projected to witness a fast growth rate over the forecast period due to the increasing popularity of the vehicular cloud technology and the features it offers such as efficient traffic management, road safety, standardization, and infotainment services. The real-time safety applications, such as remote surveillance, video capture service, and speed-based lance changing, provide enhanced efficiency to the passengers thereby accelerating the smart transportation market growth. 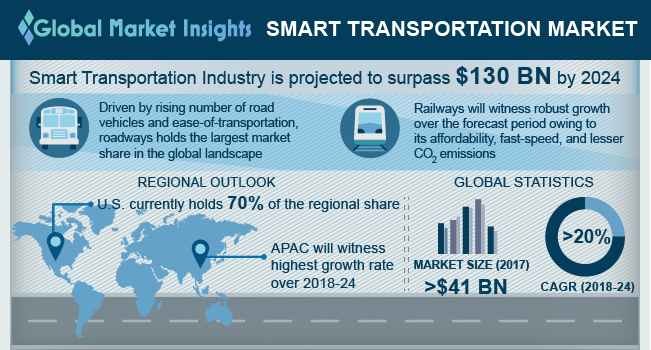 Asia Pacific smart transportation market is anticipated to show the highest growth rate over the forecast timeline. The infrastructure is still in the developing stage in this region, displaying a major opportunity for the smart infrastructure deployment, driving the demand for the smart transportation market. Furthermore, the government initiatives for developing smart cities coupled with rapid urbanization act as a major platform for the growth of the smart transportation market. The Indian government has allocated USD 7.6 billion for upgrading the smart cities until 2020. The major constituent of smart city initiative is developing an effective mobility and public transport system, providing a variety of transportation solutions. The global smart transportation market is characterized by the presence of both major market players with diverse product portfolio and start-ups that offer niche products, solutions, and services. The key players operating in the smart transportation market include Accenture PLC, Cisco Systems, Inc., Cubic Corporation, General Electric Company, IBM Corporation, Siemens AG, Thales Group, and WS Atkins. These companies are collaborating with government agencies to achieve the smart transportation vision of the government. For instance, in May 2015, the Hamburg Port Authority and Cisco partnered to develop the first smart road in Germany. This smart road, which links three streets with Kattyykbrucke bridge is developed with sensors and cameras connected to the poles along the road. The smart lighting systems on the roads are fitted with heat sensors and only turn on when a person passes by, saving the power.